I talk to a lot of women who don’t believe that there’s too much prejudice against women in the world today. Well, to be honest, maybe I didn’t. Maybe it was more that I DIDN’T CARE very much about it. Because whilst the beginning of my career had been a little rough (construction is not the place to start if you’re looking for gender equality ladies. And wow, do we need to get on with changing that STILL), on the whole being a woman has worked out pretty well for me. I made it to the top of my field. There were other women there to share the view with. What on earth were people banging on about? And then one day I was asked to champion our Women in Leadership programme. Which felt a bit blinking odd to be honest, because I didn’t get it. Yet here was my name, on giant posters and on press announcements and videos on YouTube. Didn’t seem right at all. So I figured it was time to get an opinion on it. I started with Sheryl Sandberg and Lean In. I didn’t really want to read it and I did anyway. This is actually a THING then. Whatever way you cut it, there’s pretty compelling evidence out there to suggest that women have a tougher time than men. Not only is it a thing but I’m colluding in it. Because turns out I’m biased too. It didn’t take me long to work out that when a young pretty slim blonde walked into the room, my first thought was, ‘I wonder whether she’s really up to the job’. Or that when a woman I don’t know asserts herself with slightly more confidence than most, I’m inclined to think she’s a little arrogant. It didn’t take me long to notice that nearly every leadership book I have read and love is written by a man. Yep, I’ve noticed a lot of things in the last few years. Especially how women can get into this habit of pulling each other down. How we don’t want to fight for equal rights because ‘women who are good at what they do will get the job anyway’. Yep, kind of. Except not if we have a subconscious bias that we’re not even aware of. And it’s pretty much guaranteed you do. Don’t believe me, take the gender career test on this website. I didn’t make it up (not really my strength data and statistics). It comes from a giant Harvard University Study, and I’m guessing you trust them. Plus, filling it in helps the data stay updated. 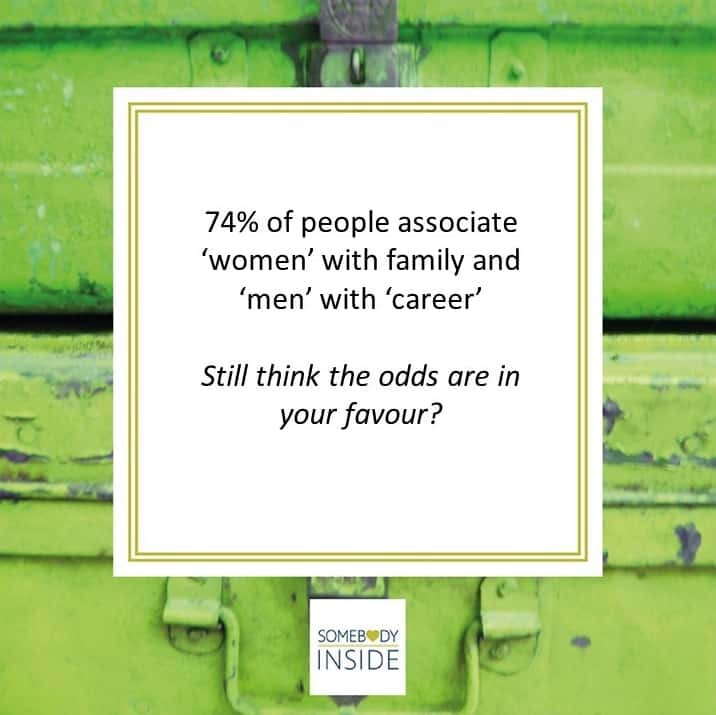 Turns out I have a moderate association with males and career and females and family. Even with all my championing and mentoring and leading and teaching women. I STILL have a moderate bias. For me that’s not good enough. Especially when it also turns out that 74% of the people who have taken this test since 2011 are mildly, moderately, or implicitly in the same camp as me. Think the odds are stacked in your favour now? The first step is being AWARE. And then working on changing. And friends, the world needs a balance of energy. It needs to reflect the needs of women as well as men. It needs to be led by women AND men together. And while we’re at it, women and men of all races and orientations and ability. You know, so that we all find our space in the world and that things just get a wee bit fairer around here. Take the test. I’d love to know how you got on and what it got you thinking about. PS You have remembered we launch our One Ping at a Time challenge on Monday haven’t you? 7 days to boost or rediscover your joy. The only thing that can happen is um, more joy. So you should really sign up.